Keep in mind, too, that pavement can get hot and burn your pet’s paws. Help your pet before you ever leave home by working with them to get used to paw protectors before the trip. This way, when you put them on during the trip your pet won’t mind wearing them. Always do a sweep of the campsite area before letting your pet out of the RV. 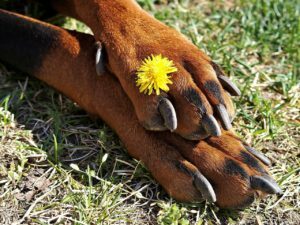 Shards of glass and other sharp objects can seriously injure your pet’s paws. We work hard to make sure your site is clean as a whistle when you arrive but doing an extra look-around can’t hurt.